25 Blunt Bob Haircuts - Hairstyles that are Timeless with a Twist! Home Hairstyles 25 Blunt Bob Haircuts – Hairstyles that are Timeless with a Twist! 25 Blunt Bob Haircuts – Hairstyles that are Timeless with a Twist! The fashion industry keeps on changing and indeed change is the predominant factor that controls the essence of this industry. With every upcoming trend, there is a certain trend d of change that can be potted in not just apparel and accessories or makeup but also the hairstyles. Change in hairstyles has always been a huge part in the fashion industry as it is capable of giving a new look. Any changes in haircut or hairstyle can make a whole lot of difference to a face. There are thus a huge variety of haircuts and styles that are incorporated. One such hairstyle that has dominated the fashion industry for a very long time is the bob hairstyle. The best part about any hairstyle is that it has never got out of fashion trends. Bob hairstyle is very easy to flaunt and most importantly it is super easy to manage. Unlike long hair, there are very fewer chances of hair getting all tangled. Also as the bob cut is meant for people who do not have much hair growth or thin hair, this haircut adds the necessary volume to the crown area. Bob style has interestingly, evolved over the past decade. The bob is probably the most prolific short hairstyle when it comes to versatile hairstyles. One such versatility of this hairstyle is the blunt bob cut. It is more proper for hair that is not frizzy, and you can also add side or center bangs. It is Best for Those with Fine Hair. For women, there are so many short haircuts to try. Hairstyles like short pixie cuts, trendy cuts, and Choppy Bob Haircuts all fall under this category of short hairstyle, and blunt bob haircut is one of them. A bob style focuses the eyes on the center of the face. How a bob style accentuates facial features is probably the most appealing aspect of the bob. The best part of bob cut is that it suits every face cut and you can choose from a wide range of variety. All the pretty ladies out there, always remember that a good hairstyle makes all the difference so wear your hairstyle with confidence and never forget the smile on your face. It is the best accessory ever. Stay beautiful! This hairstyle of Side locks Blunt Bob has a very chic and pretty look. If a woman has thin hair or does not have much volume, then this hairstyle is the one that can be the best one to flaunt. The hair is cut in a bob style, and the edges or the bottom has a blunt shape. The sides have the waves and are aligned till the chin area. This look gives your face a slimmer look. Hence this hairstyle is good for a woman who facial fat as well. Do you love the style with a tinge of color? If yes then this hairstyle is your go-to hairstyle. The color is the USP of the blunt bob. Here the hair color absolutely steals the show. The haircut will compliment a square or oval shaped face. From a formal meeting to a dinner date the feminine charm of this hairstyle is sure to work its spell on all. The golden shine adds the glamour quotient. So what is the wait all about? Get your gorgeous hair some stylish makeover. This hairstyle is all about sporting the carefree look yet stay in style. 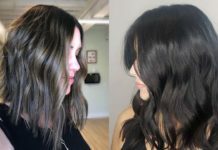 This blunt bob haircut requires the edges to be finely cut, so the strands of each hair at the bottom have a slightly undulated edge imparting that carefree look. You can create this look by keeping a center partition of the hairline and leaving the slightly uneven edged locks beside your ears or just like that. This Front fringe blunt bob cut looks very pretty. The fringes in the front of the hairstyle add all the cuteness quotient to the look. The entire look of this hairstyle can be created by taking out a center portion from the crown area. This section will have the fringe that will be till the forehead covering the forehead area. The sides are cut I a manner that it borders the sides of the face in a straight line. The look is very classy and sophisticated. This hairstyle has the locks of the front sidelong. The other side of the lock is kept slightly shorter than the other. The back side of the haircut is trimmed shorter keep the alignment almost same. One cannot look less gorgeous in this hairstyle. With a pretty dress, this haircut could look drop-dead gorgeous with this hairstyle. This hairstyle of Straight Blunt Bob makes one look absolutely gorgeous. It gives a slim tone to the face as the side locks give the face a definite shape. This kind of hairstyle has western influence and imparts a very chic look. In the fashion industry, this hairstyle is quite well known and indeed, is much I vogue. Many Hollywood stars are seen sporting this hairstyle. This haircut the blunt bob hairstyle is much to do about the length of the hair. The bottom part of this haircut is kept in alignment and short and somewhat in a round form. The fronts have sidelocks which are comparatively shorter and adds a subtle flare to the entire hair. The USP of this hairstyle is the color. It is a rich Burgundy color which makes the look far more glamorous. You can sport this hairstyle for parties, evening dates, pairing it up with a slit dress or a short dress to add the oomph factor. Do you love your unkempt look when you wake up all fresh after a good night sleep? Yet those messy locks make you look all so cute. This hairstyle is accumulating all such essence together. The Unkempt Blunt Bob haircut will look good with a body-con dress or a long maxi dress. There is nothing to accessorize your hair. Just leave the hairstyle to work its charm the way it is. This look is sure to grab a lot of attention. This haircut has a very sharp look. It imparts a stylish and chic look and highlights the jawline and the facial features of the side. If you want to create this look, then all you have to do is make a middle partition and then keep the ends of the side locks slightly longer than the bottom one and make sure that the pointed ends have the same length. This look imparts a look which is unique and is much in vogue. It is one of the most frequent look sported by the celebrities. This hairdo, Side flaunt blunt bob is all about establishing a confident you with a bold and beautiful style. This hair look can be sported by keeping the front portion longer and the back portion short till neck. The front locks are big and from a front angle seems as if the hair length is longer, but when you see it from the back end it is short. This hairstyle of Light curl blunt bob can be the eye candy for real in every event you go. This hairstyle is gorgeous and grants your wish to look anything but beautiful. The sides of the hair have very light curls hanging loosely at the side of the face and touch slightly at the edge of the shoulder. The length is not too short yet has a very subtle balance of long and short hairstyle. This is the original bob hairstyle having a blunt cut at the back, and the length of the hair is extremely short. For this hairstyle, the crown area of the head has a lot of volumes added to it. Also, this hairstyle suits best on faces which are square and enhances the face structure. With an off-shoulder dress, this hairstyle will complement your appearance, and you are sure to glamorous. This is again one of the hairstyles that have drawn the limelight of the fashion industry and has been sported by many celebrities. This hairstyle is quite new and has incorporated the twist in the Classic Bob Style. The style is that of keeping permed bob. The hairstyle is very elegant and can be flaunted on any special occasion. It brings out the style diva in you, and you are all ready to get off with the red carpet look. Maintenance of this hair is simple. A heated hair styler will suffice the need. This hairstyle has a very quire cut, and the highlight of this hairstyle is the geometric straight cuts. The front fringe of the hair is cut in a straight line in such a manner that the entire cut of the hair and the look is very mechanical and there lies the actual highlight of the look. It is as if a look from a very futuristic sci-fi movie. The hairstyle is quirky and fun to sport. As the name suggests the back slant Bob haircut has a brilliant look. The haircut gradually increases in length as it comes in the front. It is such that the back is small and the front is long with the front fringe covering the forehead. Women having broader foreheads can Look Really Cute While Sporting this Hairstyle. This hairstyle is all about sporting the ultra-sheer straight look. It is very fashionable and much in vogue as well. The look can be created by first completely straightening the hair. You can comb your hair and make sure that there no knots. The make an extreme side partition and leave the lock of hair on the other side. This hairstyle gives your face a distinct slim frame. This hairstyle looks good on the square face. The Short bob blunt cut is one very easy to flaunt hairstyle. For a formal meeting where all the official deletes are coming, you can easily sport the look and resonates a confident approach. Be glam ready in just seconds! This bob cut blunt style has some twist in it. The Hairstyle has the styles of curls, bob cut, blunt cut, the rich color. To sum it up it is a combination of different styles, and the look that is created from this hairstyle has a very versatile feel to it. This hairstyle is also extremely easy to get. Just a comb will do. This bob cut hair has brown tone with golden highlights. When you have short hair styling becomes somewhat easy. You can change the hair partition or colour your hair and this hairstyle is all about the colour. The rich and vibrant colour will look great in an evening function and sure to turn heads toward you. This hairstyle and colour also flatters the structure and complexion of the face. Are you feeling all playful and want to look cheerful? If so then this hairstyles should be your Go To haircut. It is short cute and chic. This hairstyle brings out the playful side of your persona, where you want to portray that you have a fun aspect to yourself and a friendly approach. This hairstyle is all about sporting the short hair look but in style. Fashion is all about what you flaunt in confidence. This hairstyle has very short fringes in the front but the fringe is kept in a side partition. The front has a tapered look while the crown area has volume. This hairstyle is very different from all the blunt bob hairstyles. This hairstyle is about sporting a look that is unique. It is short, the locks are like the waves of a waterfall and so goes the name and the front locks are slightly longer and gradually the hair length has subtle decrease as it goes backward. Have you ever thought of sporting the quintessential Merlin Monroe hairstyle? This hairstyle of Blunt Bob curls is all about displaying the pretty and girly charm that a women possess. The hairstyle will look good when paired up with off shoulder dress. This flared bob cut hairstyle is very easy to get. This hairstyle is not just comfortable but also there is no hassle in maintaining. For this look you can also pair it with hair accessory that can enhance the prettiness of the look. So what are you waiting for? Sport this smart look and rule the world with confidence and a smile. This square blunt bob haircut has a very gripping look. It is as if it accentuates all the features of the face and its emotion and concentrates to the face. Woman having a broad or round face can have this haircut. It gives the face a distinct frame. For this hairstyle one does not require accessories. It is classy, fashionable and one of the best blunt bob styles. A hairstyle can change the entire look of a woman. Hairstyles are important because a lot can be changed if one sports the right hairstyle. There is nothing more smart and stylish than a good hairstyle. It also gives confidence. In today’s fast-paced world, taking special care of long hair can be a real headache and a task requiring time. It require tying up, combing, styling using up a lot of hair products like serums conditioner and masks to keep long hair from getting tangled and falling off. So sporting a short hair look can be a decision enjoyed by majority. Bob style is one of the top listed hairstyles when it comes to having short styles. These blunt bob hairstyles stated above are very easy to sport, maintain and also takes least time. There is no special tying up required. All you require is just to leave open and go ahead. These hairstyles on short hair looks stunning, classy some are fun to sport while others are bold, some are pretty while some stylish. Cut the boredom and embrace the bliss of variety.